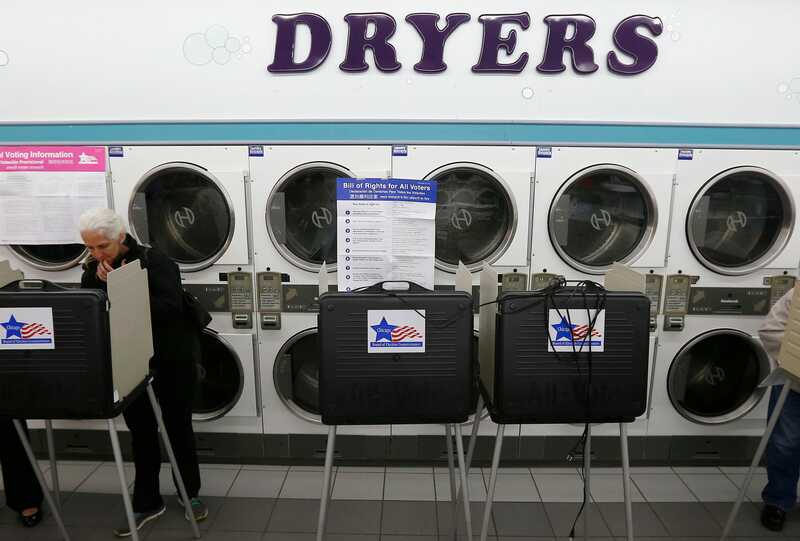 REUTERS/Jim YoungA voter looks over her ballot for the U.S. midterm elections at a laundromat used as a polling station in Chicago, Illinois, November 4, 2014. Voting is an inalienable right in the United States, one every citizen should be able to exercise if they so choose, no matter where they are. While many of us voted on Election Day in a school, civic center, or church, sometimes those facilities just aren’t available. When that happens, communities have to get creative. 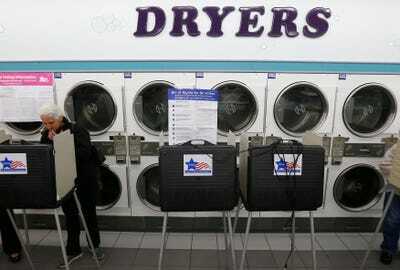 Voters in Chicago and elsewhere in the US found themselves voting in some unusual places. Some visited their local car mechanic, others their laundromat or neighbourhood diner, all of whom volunteered their space for the day. 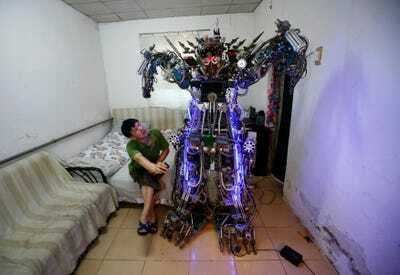 It’s just another example of American ingenuity. 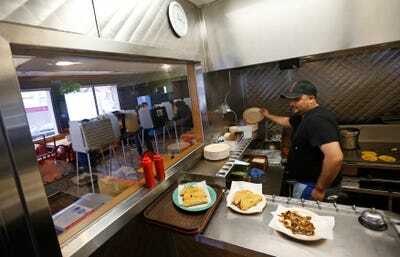 A cook prepares food orders in a kitchen as voters cast their ballots for the U.S. midterm elections at a restaurant used as a polling station in Chicago, Illinois. 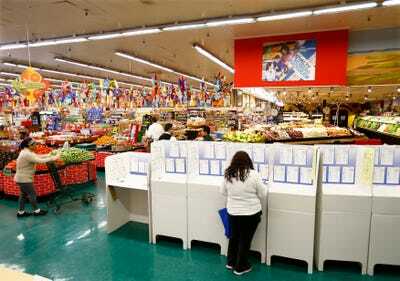 A woman votes at a polling station inside a local grocery store in National City, California. 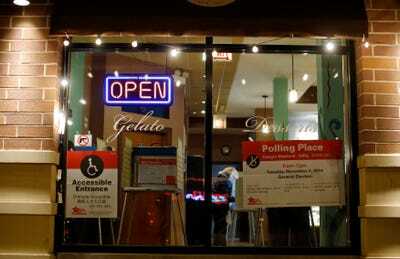 A voter is seen casting her ballot inside a dessert restaurant being used as a polling station in Chicago, Illinois. 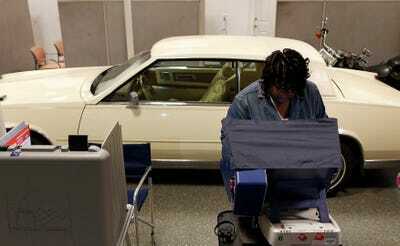 A voter casts her ballot in the U.S. midterm elections at a car dealership used as a polling station in Chicago, Illinois. 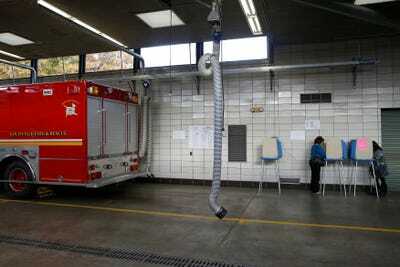 People vote at the Louisville Fire department Engine Co. No. 11 polling station in Louisville, Kentucky. 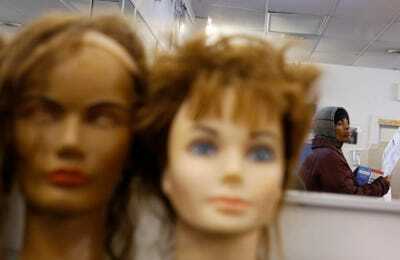 A voter is seen casting her ballot at a barber school used as a polling station in Chicago, Illinois. 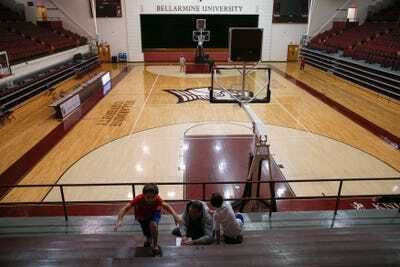 A man votes with children inside a gym at the Bellarmine University polling station in Louisville, Kentucky. 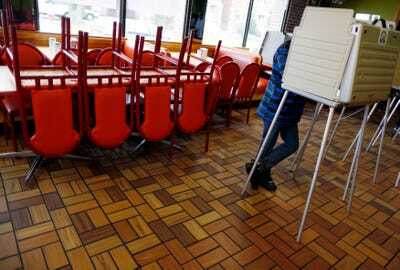 A voter stands in a voting booth to cast his ballot at a restaurant used as a polling station in Chicago, Illinois. 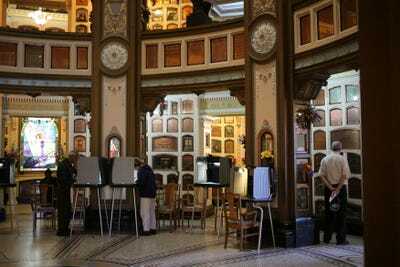 Voters cast ballots at a polling place in the Neptune Society's Columbarium on Election Day in San Francisco, California. 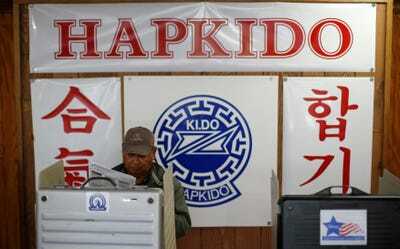 A voter looks over his ballot at a martial arts school used as a polling station in Chicago, Illinois. 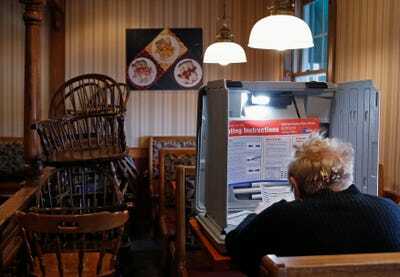 A voter prepares to cast her ballot in the U.S. midterm elections at a restaurant used as a polling station in Chicago, Illinois. 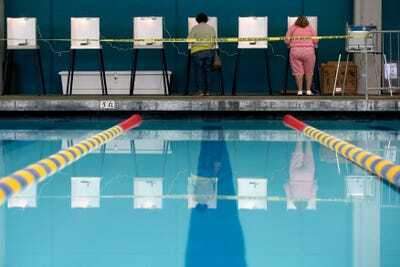 People fill out their ballots at a polling place at a swimming pool on Election Day in Los Angeles, California. 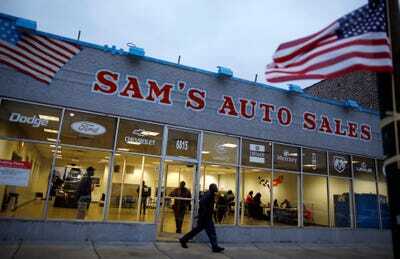 A voter leaves a car dealership being used as a polling station in Chicago, Illinois. 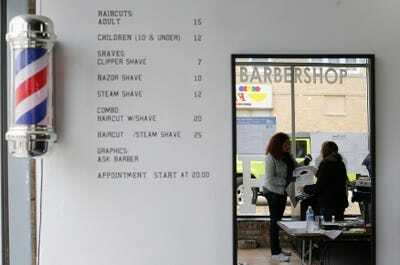 A voter hands over her ballot to an elections worker at a barber shop used as a polling station in Chicago, Illinois. 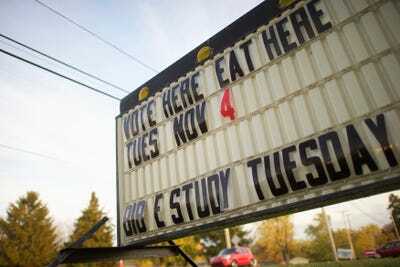 A sign outside of Starview United Church of Christ calling all to vote and eat inside on U.S. midterm election day in Mt. Wolf, Pennsylvania. 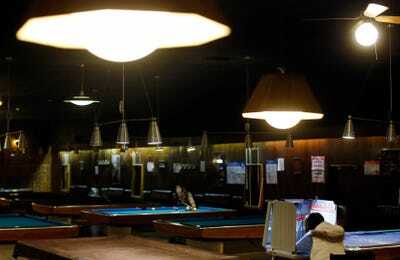 A voter sits in a voting booth to cast her vote at a billiards hall used as a polling station in Chicago, Illinois. 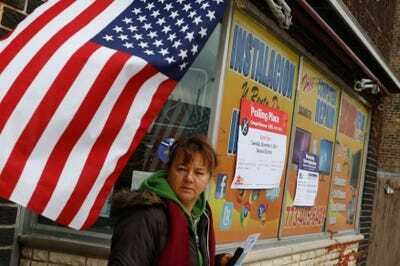 A voter leaves a computer repair shop being used a polling station in Chicago, Illinois. Wanting to see more resourcefulness from across the world?